Just like THE EWOK ADVENTURE and EWOKS: THE BATTLE FOR ENDOR, ROGUE ONE: A STAR WARS STORY is a stand alone film that takes place in the STAR WARS universe only without Ewoks. 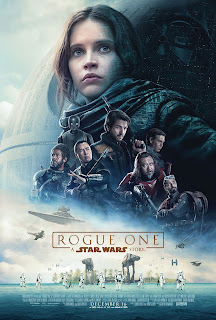 The film is about Jyn Erso (Felicity Jones) being recruited by the Rebellion to locate her father who was taken from her when she was a child to work on weaponizing the Death Star. Eventually this quest leads her and some new allies on the path to steal the plans for the Death Star and get them to the Rebellion. The story is serviced by a forgettable music score, some breath-taking visuals and horrible horrible fan service. If you like STAR WARS for it's explosions, lazers and spaceships then ROGUE ONE is the greatest movie of them all. If you like STAR WARS for its endearing timeless story and memorable characters then you will be disappointed. When I first saw the trailer for ROGUE ONE I was immediately impressed by the character of Jyn Erso. The trailer portrays her as a Snake Plissken type character. My favorite line from the trailer is when she says "This is a rebellion, isn't it? I rebel." That's a great line. Unfortunately that line was cut out as well as any other possible scene or moment that would make her a strong or even memorable character. Instead she comes across as a scared little girl forced into a situation she never would have put herself in. Yeah, the film makes it a point to show her beat up a bunch of storm troopers but that doesn't make her a strong character. She is just an action figure. Jyn has no good moments. She gives a couple of speeches that come across as out of step with her character. Jyn is a non-character in her own story. She has not earned the right to be the biggest character on the movie poster. She never really seems to be a part of the Rebellion even though she has experienced personal loss at the hands of the Empire. You would think she would have been in the Rebellion from day one. I'm not even sure what she was doing before being rescued/captured by the Rebellion and setting her on the mission to find her father. CLICK HERE TO READ THE REST!! !